It’s hard to think of graffiti without the connotations of illegality. Tagging, which rose to prominence in the 90s, has always been seen as an art form for youth and rebellion. However, now that it has surfaced and gained in popularity and prominence, classes and workshops on the matter are freely available even to those who have no intention of taking the art form into the street, where it is at home. Lee Wessels is one of the forerunners in Ho Chi Minh City’s nascent graffiti scene. His workshops were originally aimed at school children as an after-school activity but, with rising popularity, they have started to include adults and younger children as well. Graffiti, it seems, is well and healthy. Lee, a Dutch national adopted from South Korea, is a long-standing graffiti artist who mixes the forms he learned by running around in the streets with the more orthodox, academic teachings from art school. The popularity of his works is such that he has been invited to decorate some of Ho Chi Minh City’s most recognizable hotspots, including Indika, Outcast, Piu Piu, the Saigon skate park and En-Dee Garden. In the two-and-a-half short years he has been here, he has certainly already left a mark. 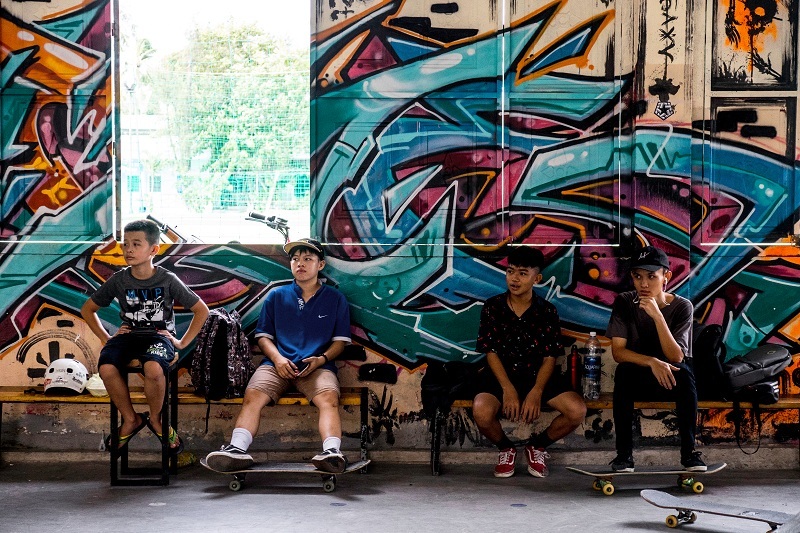 The quality of Saigon’s own graffiti scene, he says, is the fact that the community is supportive and devoid of the machismo found in other cities. The groups that he teaches are there to help each other and while there is a healthy spirit of competition, it is not so aggressive as to cow the inexperienced. Most of all it seems that those who want to get involved in graffiti want to spread a message of positivity. The spirit of tagging in Saigon is less rebellious than it is encouraging, hoping to find a way to beautify and color places that otherwise would remain visually anonymous. The question that most perturbs me is whether graffiti can still be considered graffiti once divorced from its background of illegality. Underground art forms are stripped of that fashionable title when they are given a mainstream spotlight and graffiti classes are certainly a step in that direction. The origins of graffiti, more than many other art forms, seem to be steeped in the clandestine. Lee considers then tells me that the feeling behind the art may change, the rebellion that made the illegality of the art form so attractive may disappear in a classroom, but the techniques remain the same. Whether your motivations are to take the lessons and bring them back to a hidden alley to mark your territory, or something a little bit more private, the skills you can learn at Lee’s classes remain equally useful. The lessons cover different forms of graffiti art: Solid Murals (co-founded by Lukas Harrer, www.facebook.com/solidmurals) focuses on finding new ways to decorate surfaces while Saigon Creative English (co-founded by Thomas Dijkhuizen, www.facebook.com/scevietnam) offers courses on writing and fonts using aerosol and stencilling techniques. From top to bottom and back to front, Lee’s classes can cover everything from beginners to more advanced graffiti artists who want to hone their talents or simply find a group to share their passion with. 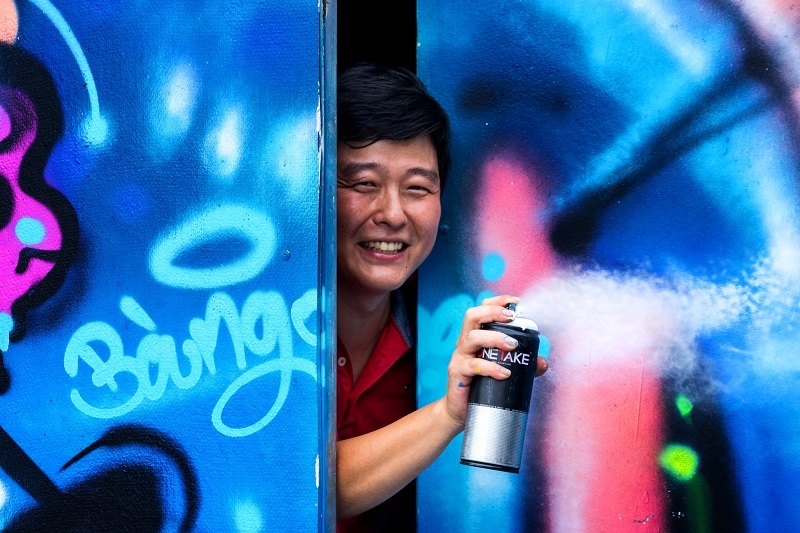 To that end, sharing graffiti with everyone, Lee has recently opened classes in District 13, the first workshop in Vietnam to cover a full course in graffiti. Included are classes on the history of graffiti, graffiti techniques with aerosol and stencilling, design technique, 3D techniques and even courses on how to design your own themed mural. The course is a complete crash course and 15 percent of the proceeds go to charity, purchasing materials needed to teach the same courses free of charge for orphanages and shelters. As an orphan himself, Lee explains that he wants to give something to those who went through the same hardships. One of the great attractions of graffiti for Lee is the fact that it can bring beauty or a message to unexpected places. Art is so often confined to the gallery or to a website and people have to go to the bother of seeking it out. Graffiti is a public art form that can be displayed to hundreds of people. While it may be unfair to call the art passive, there is a side to it that hopes to blend into the environment and to fit in organically. In that sense, graffiti is equally at home as a largescale eye-catcher in the style of the Los Angeles street art that has become an instantly recognizable characteristic of the city, as it is as a more subtle, downplayed art form that lends beauty without being invasive. For Lee, the graffiti scene in Saigon is only just starting. The city is youthful and different art forms from music to dance to graffiti are starting to get a dedicated following. It’s an exciting time to be an artist in Saigon with so much innovation underway and Lee only sees its star rising.